Geography may not be fate, but Fate certainly knows her geography. And when she wanted to inculcate me with a keen interest in languages, she took great geographical pains to achieve it, starting as far back as the 1930s. In that decade, my father was born in the Dutch city of Enschede (the red dot marked 1 on the map – click to enlarge), a mere five kilometres from the German border. He grew up speaking not only the national language but also the region’s Low Saxon dialect of the Low German language. He went on to become a French teacher, dabbling in Spanish on the side. Having moved to the south of the country, he then learnt another regional language, Limburgish, about which more in a minute. Finally, he also became fluent, though not grammatically perfect, in German, so much so that later in life, when his other languages were temporarily wiped out by a stroke, he would only speak German. From a linguistic perspective, Fate did an excellent job with him. What about my mother? She grew up in red dot number 2, speaking Limburgish and Dutch. Her village was within waving distance of Flanders – where the Dutch is markedly different from her own – and a short cycle ride away from Germany. She also spent four years under German occupation. After liberation, English was all the rage. But my mother’s true linguistic love has always been Dutch. For her, no conversation is completely satisfactory without occasional recourse to the dictionary. 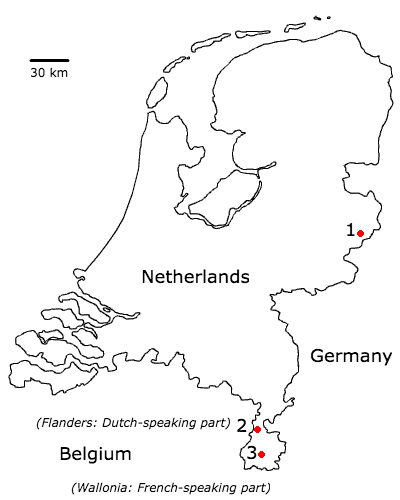 After my parents got married and my sister and I were born, we settled in a tiny village whose name is pronounceable exclusively – and then only just – for native Dutch speakers (Scheulder, [sxøːldər] – red dot 3). German, French and Flemish-Dutch were spoken just 15 kilometres to the east, south and west, respectively. And that’s without mentioning the variety within the region: the dialects of towns just 30 kilometres apart were so different that people would switch to Dutch rather than be baffled by each other’s Limburgish. I myself was teased by class-mates because my dialect – roughly my Mom’s – sounded weird to them. In a word, I was fated to be a language buff. Lingo and my other books have been eighty years in the making. So, how about a name for your mother’s town, red dot #2? Geleen? Maas-Mechelen? While I’m Canadian-American, I lived in Maastricht for three years and have dear friends from Roermond and Geleen. _Lingo_ came home with me today from the library. It looks like lots of fun! Berg aan de Maas, also known as Berg-Urmond. Enjoy Lingo! I read your book Lingo with interest and enjoyment – I love words. I wanted to tell you that omeni – the Romanian word for the virtue of being fully human , that is : gentle, decent, respectful, hospitable, honest, polite is very much like the Yiddish word : mench. Yiddish is a rich and highly expressive language with great nuance and humor – and lots of memorable literature. The language is kept very much alive, transferred from parent to child in Chasidic Jewish communities around the world where the language is an important part of identity and is the mother tongue for many children. The word mench (usually spelled Mensch or mensj) is sometimes used in Dutch, though I’m not entirely sure what it’s meant to mean. I have interpreted it as ‘a character, a warm-hearted person with somewhat unusual traits’. Incredibly, it’s not in my Yiddish-Dutch word list. Yiddish has extremely few speakers, especially native speakers, in the Netherlands nowadays. Just across the border In Belgium though, there is a community of several thousand in the city of Antwerp. 1. Yiddish is spoken by the super orthodox Chasidim in Israel. They feel that Hebrew is a holy language that should not be profaned by common everyday use. 2. Why didn’t the Swedes use English as a model. You is the old plural polite form that is used for adults and children. Problem solved. Point 1: I didn’t know that! I did learn the other day that well over 100,000 American Jews speak Yiddish, even handing it down to their children. But I don’t know if they would be Chasidim as well. Point 2: The Swedes did just that for a while. But they never liked it much.